The driver will unload by hand if you are not able to assist. These un-tanelised, chunky pine raised gardens are available in 5 different sizes from 0.95m x 0.95m up to 2.0m x 3.0m. 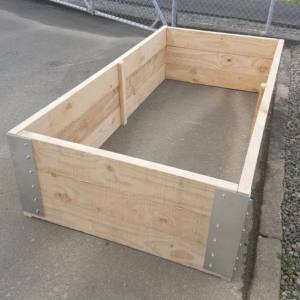 Pictured is a 1.0 x 2.0 x 0.45m garden bed. Check out our other product listings for other size options. You can choose the shape of garden bed that best suits your requirements, although the rectangular shaped garden beds do tend to be the most popular. Height of the garden bed is between 0.15m to 0.6m, depending on how many 150mm boards are stacked on top of each other. A thick grade of NZ grown pine timber is used and the kits include the timber, heavy duty aluminium corner brackets and screws for easy assembly. You can also order the optional cloche hoop system for protection of your plants, as shown in the photo gallery. You can download installation instructions here.